The fact that my parents let me do this is still amazing to me. 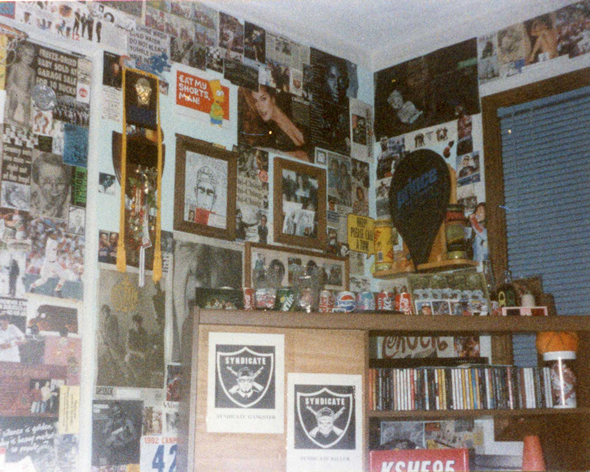 Somewhat inspired by Ferris Bueller's bedroom, it started with a few pictures here and there and quickly overtook all four walls of my own bedroom. Any time I came across a picture that I found interesting, I would cut it out and add it to my wall using either yellow or blue plastic tack. Unfortunately, photos of only one of the four walls exists -- however, these pictures were taken at different times showing slight changes in the arrangement of my "decor." I believe the first picture to be the oldest of the two based on the size of my CD collection. 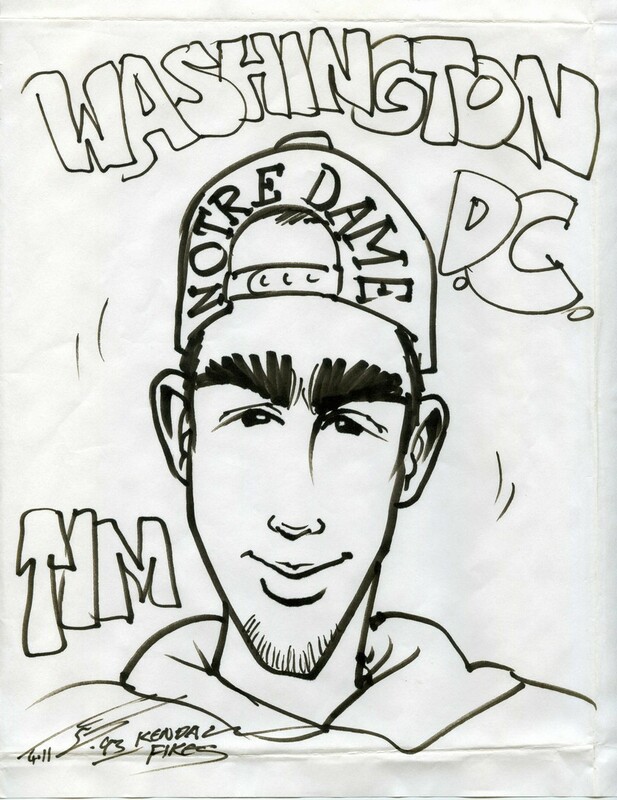 This image was taken sometime during my senior year of high school as the caricature drawing in the frame is from the junior trip to D.C. and the pictures stuck around the frame's border are of friends that I met during the summer of 1993. My best guess is that it was taken sometime late in the summer of 1993 or near the start of the 1993-1994 school year. At least four pictures of a young Anna Nicole Smith. My prized Nerf baskeball hoop in the last stages of its existence. A drawing of Torn Flesh lead man, Greg Hudson -- just to the left of the closet door. A newspaper article about Jennifer Capriati -- top left corner of the photo. Spike Lee as Mars Blackman -- near bottom right of the closet. The early stages of my CD collection -- only two or three dozen at this time. A small speaker on top of the Nintendo that I don't think was connected to anything. Plastic Cubs helmet I got at Dairy Queen several years earlier. A foil McDonald's ash tray -- to the right of the Nerf hoop. A bag from Hard Rock Cafe. Considering my CD collection in this second picture has outgrown the plastic case it was housed in previously, this photo is obviously taken several weeks/months later. My closest estimation puts this picture somewhere around mid-fall 1993 due to the fact that there is a copy of a picture from my senior year homecoming dance framed on top of the entertainment center. Full soda cans including a Cherry Coke can from the summer of 1989. Charles Barkley USA Basketball cup from McDonalds. A CD collection that has almost doubled in size since the previous picture. Brady Anderson baseball cards inside framed 1993 tennis team picture. Cindy Crawford....Jerry Rice...Bart Simpson...Charles Barkely. The number from a race I didn't run in. 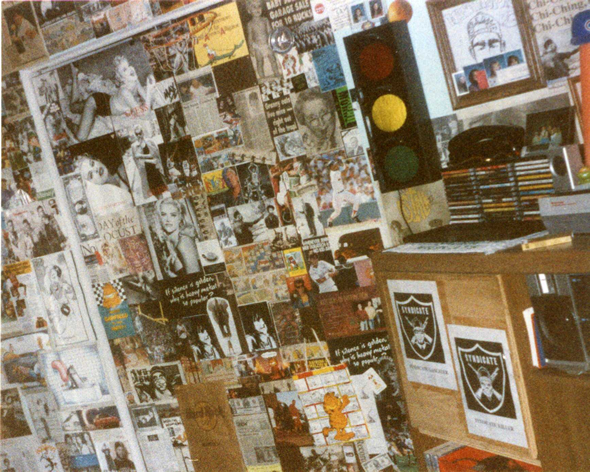 While the pictures from my bedroom wall of yester-year are long gone, I can't say I've outgrown my fascination with creating this type of collage. Currently, about a quarter of one wall in my office at work has a very similar look and is continuously spreading. My name cross-stiched on a small piece of fabric. A St. Louis Cardinals pocket schedule. An NFL bed spread set (matching curtains not pictured). A red comb used to ensure proper feathering of my hair. A index card box used to catalog whatever I was cataloging at that time (probably baseball cards). An orange plastic straight-edge from my Crayola art kit. Plastic Goofy light switch cover. The early stages of my music collection. A record player/stereo I got from a garage sale two doors down. Bumper stickers from local radio and TV stations. Calendar from local bank -- what better verification of the year this picture was taken than a calendar on the wall?!? Nice, Shawn! Very cool to see that sheet of stickers up close again! This was a very cool thing to see. 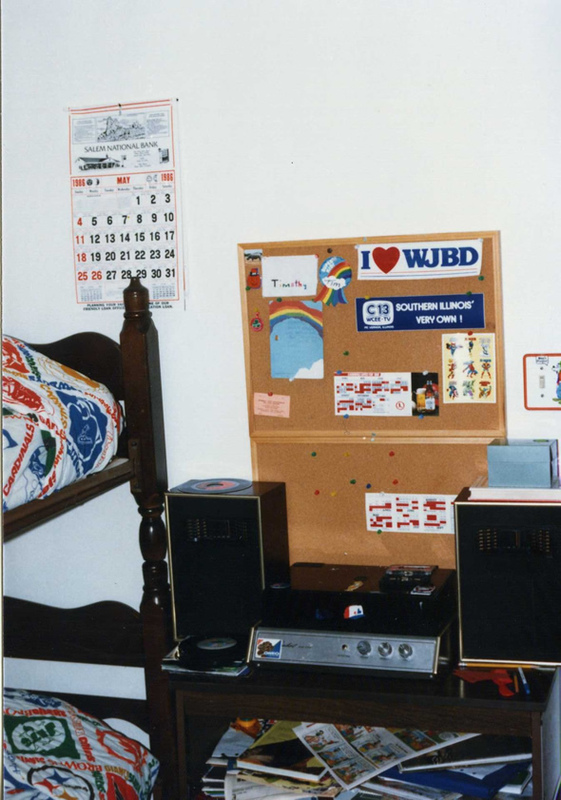 I was overjoyed to find a photo of my childhood bedroom recently and I studied it. I bet you are glad to have those photos! It's amazing that we're able to do what we've done in identifying even the smallest clippings on our walls after all these years.